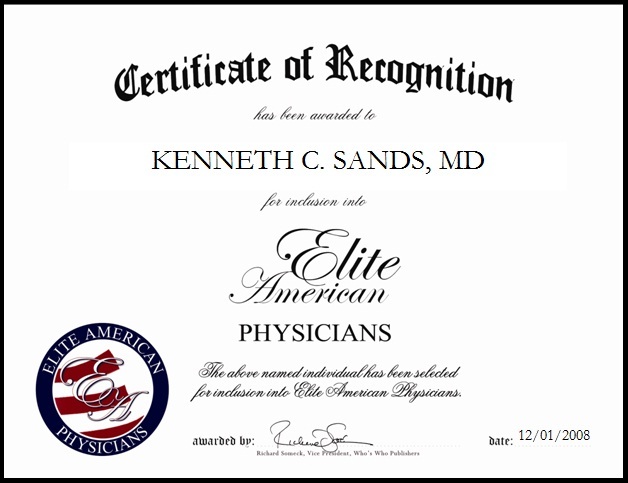 Merritt Island, FL, February 12, 2015, Kenneth C. Sands, MD, Surgeon for Viera Sports Medicine, has been recognized by Elite American Physicians for dedication, achievements and leadership in orthopedic surgery. Prior to starting with Viera Sports Medicine and Orthopedics, Dr. Sands was practicing at Harbin Clinic. He chose to transition from the Harbin Clinic to Viera Sports Medicine and Orthopedics in order to help develop a new Total Joint Program at Viera Hospital. The hospital opened its doors in April, 2011 with the mission of providing state-of-the-art orthopedic care in a patient-friendly environment. Dr. Sands’ practice offers many unique surgical procedures. Through his years in the military and in private practice, he has developed a comprehensive repertory of surgical procedures related to joint reconstruction. His practice ranges from tumor prosthesis to hip resurfacing, to partial knee replacement. In recent years, Dr. Sands has moved toward a concept of bone preservation. Since that time, Dr. Sands has honed his skills in partial knee replacements, isolated patellofemoral replacements and hip resurfacing. As a result, he has found tremendous gratification in offering these services. A pivotal moment in his career occurred in 2006, when he was selected to be one of the first 50 surgeons in the U.S. to perform hip resurfacing. 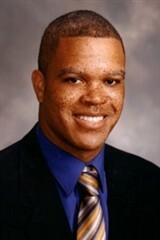 He performed the first Birmingham hip resurfacing procedure in Georgia at Floyd Medical Center. That event launched his interest in developing a world view of orthopedics and allowed him to travel around the country lecturing and teaching others. Over the years, Dr. Sands has made many waves in the field of orthopedic surgery, however, he marks his greatest career achievement as the establishment of the Center of Excellence in Total Joint Replacement in Rome, GA. Rome is a unique city of 39,000 people that can offer world-class services with regard to health care. Their designation by the Joint Commission confirmed their high level of expertise and commitment to patients locally and regionally. Upon reflecting on a rewarding career, Dr. Sands feels appreciative to be able to make such a strong impact on others’ lives, and to play sucha key role in the enabling of patients to do things they could not do otherwise. This entry was posted in Orthopedics, Osteopathic medicine and tagged empowering patients, joint care, licensed physician, patient care. Bookmark the permalink.